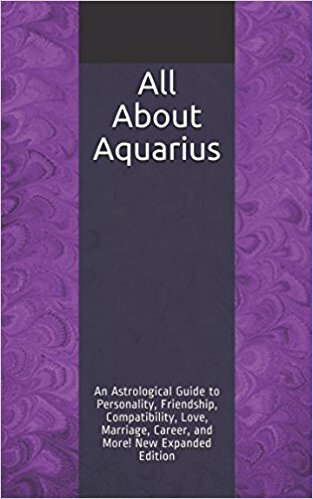 All About Aquarius, New Expanded Edition, now available in paperback and Kindle! Agreeable, visionary, friendly, and open-minded, the Aquarius-moon person thrives on change and seeks the unusual. The moon in Aquarius creates a quirky, eccentric personality that comprises an interesting blend of the rational and the intuitive. Intellectually well-rounded, the Aquarius-moon person has a broad array of interests and draws friends from a wide variety of demographics. However, despite the fact that they rarely have trouble-making friends, lunar Aquarians often feel that they don’t really fit in or belong anywhere. Lunar Aquarians tend to be people-oriented and very interested in the ideas and problems of others. Inclusive by nature, they stick up for those who are unfairly persecuted and work to ensure that nobody is left out in any social grouping. Romantic relationships for the Aquarius-moon person resemble friendships among equals rather than traditional partnerships. True love is often found in the later years of life, and is most likely to last with a partner who is open-minded, independent, imaginative, and unusual in some way. Tolerant and easy-going, lunar Aquarians give others the freedom to be what they want to be and do what they want to do, and they demand these freedoms for themselves as well. Clingy, insecure types are unlikely to be happy with Aquarius-moon people because they are not the sort to spend every moment with their romantic partners or confine themselves to a single best friend. Although they are capable of being sexually faithful, they tend to be sociable and need to spend time with others who share their quirky interests. When Aquarius is prominent in the chart, there is often an idealistic, progressive, humanitarian urge. Fulfillment comes through involvement with active groups and social movements whose goals are to improve the world in some way. Lunar Aquarians are fiercely individualistic. They don’t follow popular trends, but instead forge their own paths. Stubborn by nature, they are unlikely to change in response to criticism. Rather, it tends to make them dig their heels in and continue doing whatever has provoked the negative reaction. The Aquarius-moon person may also argue just for the sake of arguing. However, this is usually done for intellectual stimulation rather than as an expression of anger. Because lunar Aquarians tend to analyze emotions rather than simply feeling them, they are not usually passionate, but they are able to offer a fresh perspective on the problems others face. Unencumbered by sentimentality or the extreme emotional states that afflict some of the other moon signs, they have a clearer vision and a more optimistic outlook. Lunar Aquarians may find emotional displays in others difficult to deal with or even alarming. They tend to dislike messy emotions and prefer cool logic and rationality. The Aquarian emotional detachment can be upsetting for more sensitive types, who may find Aquarius-moon people too tactless and insensitive for their tastes (though if the sun or ascendant fall in a water sign, the lunar Aquarian is more sensitive and attuned to the feelings of others). Lunar Aquarians are not afraid of the future; rather, they embrace it. Quirky and unpredictable, Aquarius-moon people thrive on change and novelty. Routine can be depressing, whereas new experiences enhance their psychological well-being. Under stress, the Aquarius-moon person is liable to behave very strangely and to make sudden radical life changes, for better or for worse. Security comes through progress, and insecurity through lack of movement. When lunar Aquarians do finally settle down somewhere, they tend to fill the home with an eclectic assortment of objects that reflect their unusual hobbies and interests rather than adopting traditional decor. An appreciation for the unusual makes lunar Aquarians more tolerant and open to new opinions and experiences than most. They tend not to be judgmental, except when confronted with those who cling to old traditions and outmoded ideas. Prone to strokes of brilliance, the lunar Aquarian has a profound capacity for innovation. The futuristic Aquarian outlook, combined with the intuitive proclivities of the moon, can also give some degree of clairvoyance or moments of genius, though the Aquarius-moon person may not do anything productive with this unless the sun or ascendant fall in a more stable sign. There is often an interest in scientific or futuristic things with this placement, which may draw the lunar Aquarian to either the sciences or occult subjects, or at the very least, science fiction. When there is a fortunate convergence of humanitarian ideals, intellectual creativity, and scientific interests, the likelihood of invention, innovation, and brilliant discovery increases dramatically. For more on Aquarius, see the Aquarius Personality Profile. To see personality and compatibility profiles for all the sun signs, visit main Astrology page.